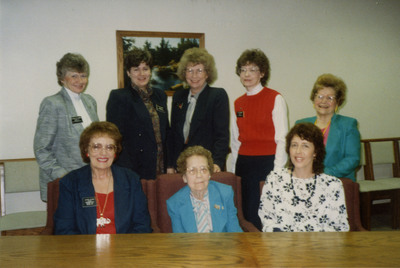 "North Dakota Women of Power"
Photograph of Rosemarie Myrdal, State Representative Dagne Olsen, and six unidentified women around a conference table. Olsen is the front row on the far left, while Myrdal is the middle of the second row. Dagne Olsen represented District 19 (Grand Forks County) in the House. A Republican from Manvel, she was elected to the House of Representative in 1980 and served until her death in 1994.